Praise God with trumpet sound; praise God with lute and harp! Praise God with tambourine and dance; praise God with strings and pipe! Praise God with clanging cymbals; praise God with loud clashing cymbals! Let everything that breathes praise the Lord! Praise the Lord! Sara D. Gleason attended the Crane School of Music at SUNY Potsdam. While at Crane, Mrs. Gleason was a member of Sigma Alpha Iota, an international music fraternity for women, A Sharp Arrangement, the women’s a cappella group on campus, and the American Choral Director’s Association. One of her great accomplishments at Crane was being selected to rehearse and conduct the Crane Chorus, a 150 voice choir, at the annual Candlelight Concert. She received her Bachelor’s of Music in Music Education in May of 2005. During the 2006-2007 school year Mrs. Gleason directed the children’s choirs at Asbury Methodist Church in Watertown. In December of 2007 she received a Masters of Science in Education with Distinction from SUNY Potsdam. She began her teaching career at Copenhagen Central School and is currently the vocal music teacher at Watertown High School. Carl Bingle is a native of Carthage, NY whose musical abilities and interests were nurtured from an early age by Jane Rich and George Fullerton. He studied organ with Dr. Charles H. Finney at Houghton College before graduating from SUNY Potsdam in 1974 with a BA in French and German. In 1975, he began his teaching career at Belleville Academy (now Belleville-Henderson Central School) and continued there until 2009. He is currently an adjunct instructor of German at Jefferson Community College in Watertown. 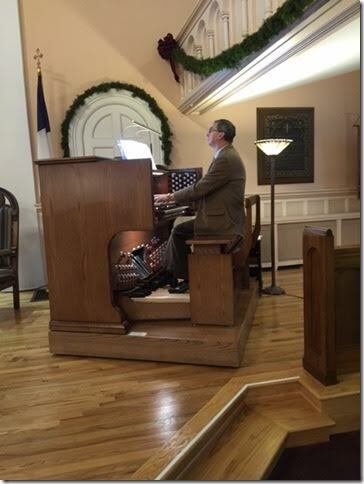 Carl has been the organist at Carthage United Community Church and Adams Village Baptist Church before joining the music staff at First Presbyterian in January of 1990. He has also been the organist for the Northern Choral Society since 1977, a group that rehearses each fall in our Fellowship Hall. Jennifer Whitenack grew up at First Presbyterian. She graduated from the College of Wooster in 1988 with a degree in music education. Jenny is also director of the River Ringers community hand bell choir. The Chancel Choir, directed by Sara Gleason, rehearses every Thursday evening at 7:30pm and warms up at 9:30am on Sundays. This group consists of adults and young adults starting at the 9th grade. The choir participates each week (except during July and August) in the Sunday morning worship service which is at 10am. There are solo opportunities for vocalists and instrumentalists during the prelude and offertory portions of the service. here are 3 handbell choirs directed by Jennifer Whitenack. The ages run from third grade on up. The church owns 5 octaves of Schulmerich handbells, 3 octaves of Malmark handbells and 3 octaves of handchimes. The beginner handbell choir consists of students in grades 2 and up, as well as adults who are at a beginning skill level. They rehearse on Sunday mornings at 9:15am before worship upstairs in the music room in the Christian Education wing. The advanced youth and adults handbell choir is for more experienced students, ready to learn more advanced techniques and participate in small ensemble work. They rehearse at 11:15 on Sundays in the Christian Education wing. The Rainbow Ringers handbell choir is for both adults and youth in 9th grade and up who have played bells for the fun of it for years and newcomers alike. The group works hard to prepare pieces for church and at times for activities outside of the church. Rehearsals are Thursday evenings at 6:30pm in the sanctuary from September to April. Handchime choir for preschool to 1st grade is offered whenever there is interest.